View of “Chto Delat: On the Possibility of Light,” 2017. At left: Performance Practices of Our Time, 2017. Lighthouse (It Is Getting Darker), 2017, is a large wooden lighthouse from which, rather than light, brown banners protrude like cotton rays. The structure connects to a series of small hollow figures, The Memorials for Weak Light, 2017, each lit up from within in commemoration of individuals who died as a result of ongoing struggles against fascism across the world. This exhibition by Chto Delat, a Russian collective of academics, activists, and writers whose name translates to “What should be done,” seems to answer their namesake question with this simple metaphor: Stare into the darkness, and you will find the light. The main work on view, It Hasn’t Happened to Us Yet. Safe Haven, 2016, is a video shot at a Norwegian residency for artists at risk of censorship or persecution in their home countries. Though fictional, it features the actual inhabitants of the island location and explores what constitutes safe and unsafe spaces in a global political climate where the boundary between the two is increasingly unstable. Here, the lighthouse reappears as a symbol of both rescue and danger, with the resident artists telling their stories from the top of a tower and shouting into the fog for boats to remain in obscurity until light returns, to avoid crashing into the shore. The last room of the show is covered in inexpensive digital prints plastered onto the walls, like in a teenage bedroom. 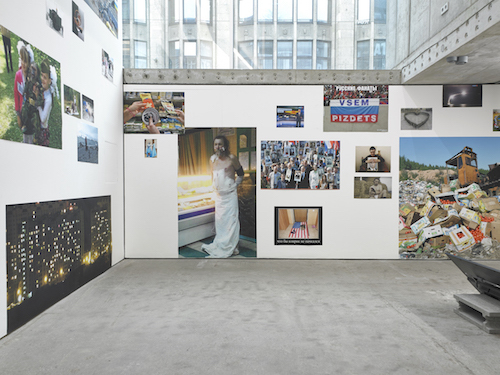 This installation, Performative Practices of Our Time, 2017, immerses the viewer in an eclectic mix of images from Christian Orthodox–themed nail art and absurd internet memes to a Russian missile launching into Syria. The display is funny, disgusting, and genuinely disturbing––a dark, grim portrait of our contemporary moment which we must first get to know intimately before we can do anything to change it.